Did you ever see the movie One Fine Day? At one point Michelle Pfeiffer spills coffee on her shirt and winds up having to wear her son’s dinosaur tee as a top. 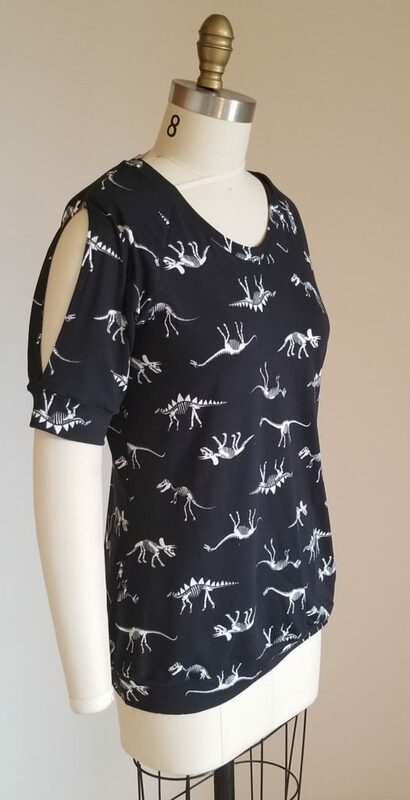 Ever since then I have want a dinosaur top…. now I have one. I had picked up this print for Easton about a year ago and he wasn’t thrilled about it. So when trying to pick out fabric for my Lucky Girl top, I decided to give this a try…. and it’s so cute (not as awesome as the tiny dinosaurs in the movie, but equally as fun)! This was also my first go with an Ellie & Mac pattern and I have to say that I’m thrilled with the outcome. The fit is good, the pattern pieces came together well, and the instructions were great. In fact I like it so much I plan on making another top (in a more traditional fabric) AND I picked up the Discoverer Tee pattern (I love the contrast yoke) too. This entry was posted in Uncategorized on February 4, 2019 by stacy.